Color: Brindle, black and wheaten. Coat: Double coat with wavy, wiry, long outer coat. Is a Scottish Terrier the Right Dog Breed for You? 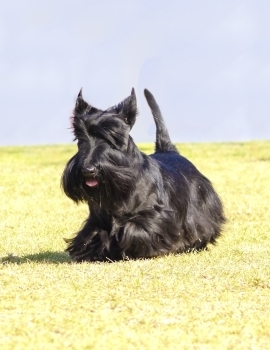 The Scottie is intelligent and lively with great stamina. They can be suited to country or urban living. They bond well with older, calm children, but socialization and firm, gentle training at an early age will help them to be a better family dog. They are quite protective and can border on aggression. They will alarm bark. They are low shedders but require regular grooming and clipping.